Being an action movie hero is all about style. Action movies have it all: action, um, more... action. Ok, but that action part, they've got down pat, and that's why we love 'em. The bad guys that can't aim, the protagonist jumping around like a monkey, the impossible crashes, explosions, and so on. Good stuff. 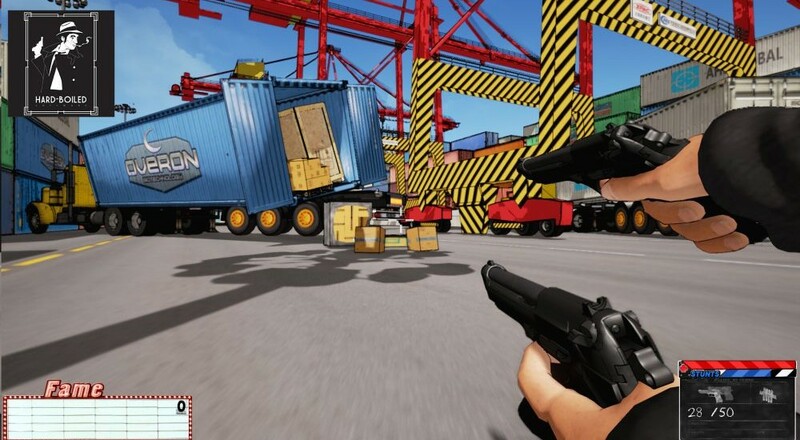 Now, imagine if the stunts and "realism" of 80s and 90s action films was stuffed into a video game. Welcome to Killing, My Friend. From Hard-Boiled Software, the makers of the Half-Life mod Action Half-Life, Killing, My Friend is a co-op shooter that goes wild with its action and survival sequences. Your team's goal is to stay alive while waves of enemies swarm the arena. The catch is you aren't just trying to stay alive, you're trying to do it stylishly. Earn Fame by performing stunts like dives, slides, rolls, wall running, and more, just like that guy in that movie. You know the one I'm talking about. The stunt system forms the core of Killing, My Friend's gameplay. Easy to pull off, hard to master. It's all about combos and points. Working with your co-op pals also means you kinda have to work against them. You'll need them to stay alive (corpses don't win many awards), but you still need to out-style them to actually win. A healthy dose of traditional deathmatch and team multiplay modes are also available, just in case all the out-Fonzing is too much for you to handle. Killing, My Friend was just Greenlit by the Steam community, so watch for a playable demo and details about the release soon. Page created in 0.8083 seconds.